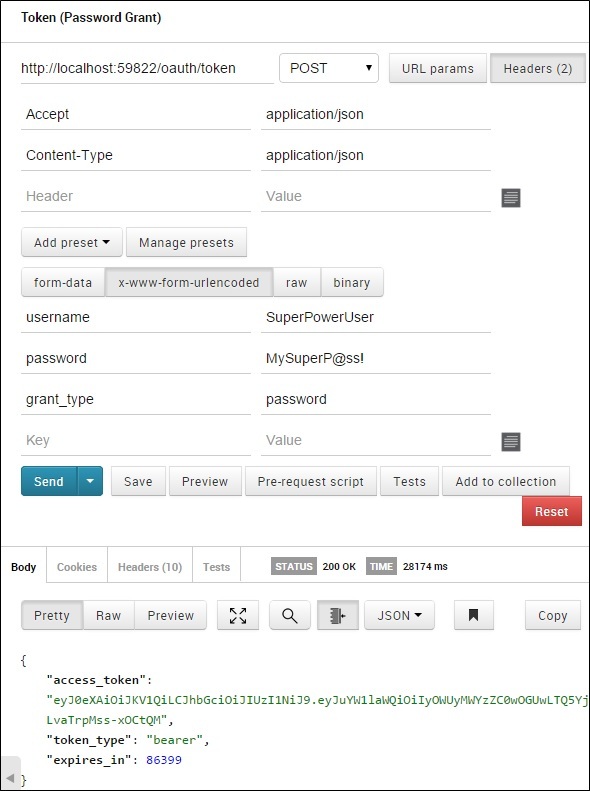 Currently our API doesn’t support authentication and authorization, all the requests we receive to any end point are done anonymously, In this post we’ll configure our API which will act as our Authorization Server and Resource Server on the same time to issue JSON Web Tokens for authenticated users and those users will present this JWT to the protected end points in order to access it and process the request. I will use step by step approach as usual to implement this, but I highly recommend you to read the post JSON Web Token in ASP.NET Web API 2 before completing this one; where I cover deeply what is JSON Web Tokens, the benefits of using JWT over default access tokens, and how they can be used to decouple Authorization server from Resource server. In this tutorial and for the sake of keeping it simple; both OAuth 2.0 roles (Authorization Server and Recourse Server) will live in the same API. We are going to build an API which will be consumed by a trusted client (AngularJS front-end) so we only interested in implementing a single OAuth 2.0 flow where the registered user will present username and password to a specific end point, and the API will validate those credentials, and if all is valid it will return a JWT for the user where the client application used by the user should store it securely and locally in order to present this JWT with each request to any protected end point. The nice thing about this JWT that it is a self contained token which contains all user claims and roles inside it, so there is no need to do any extra DB queries to fetch those values for the authenticated user. This JWT token will be configured to expire after 1 day of its issue date, so the user is requested to provide credentials again in order to obtain new JWT token. If you are interested to know how to implement sliding expiration tokens and how you can keep the user logged in; I recommend you to read my other post Enable OAuth Refresh Tokens in AngularJS App which covers this deeply, but adds more complexity to the solution. To keep this tutorial simple we’ll not add refresh tokens here but you can refer to the post and implement it. As you notice the “ValidateClientAuthentication” is empty, we are considering the request valid always, because in our implementation our client (AngularJS front-end) is trusted client and we do not need to validate it. The method “GrantResourceOwnerCredentials” is responsible for receiving the username and password from the request and validate them against our ASP.NET 2.1 Identity system, if the credentials are valid and the email is confirmed we are building an identity for the logged in user, this identity will contain all the roles and claims for the authenticated user, until now we didn’t cover roles and claims part of the tutorial, but for the mean time you can consider all users registered in our system without any roles or claims mapped to them. The method “GenerateUserIdentityAsync” is not implemented yet, we’ll add this helper method in the next step. This method will be responsible to fetch the authenticated user identity from the database and returns an object of type “ClaimsIdentity”. Lastly we are creating an Authentication ticket which contains the identity for the authenticated user, and when we call “context.Validated(ticket)” this will transfer this identity to an OAuth 2.0 bearer access token. Now we want to configure our API to issue JWT tokens instead of default access tokens, to understand what is JWT and why it is better to use it, you can refer back to this post. There is no direct support for issuing JWT in ASP.NET Web API, so in order to start issuing JWTs we need to implement this manually by implementing the interface “ISecureDataFormat” and implement the method “Protect”. The class “CustomJwtFormat” implements the interface “ISecureDataFormat<AuthenticationTicket>”, the JWT generation will take place inside method “Protect”. The constructor of this class accepts the “Issuer” of this JWT which will be our API. This API acts as Authorization and Resource Server on the same time, this can be string or URI, in our case we’ll fix it to URI. As we stated before, this API serves as Resource and Authorization Server at the same time, so we are fixing the Audience Id and Audience Secret (Resource Server) in web.config file, this Audience Id and Secret will be used for HMAC265 and hash the JWT token, I’ve used this implementation to generate the Audience Id and Secret. Do not forget to add 2 new keys “as:AudienceId” and “as:AudienceSecret” to the web.config AppSettings section. Then we prepare the raw data for the JSON Web Token which will be issued to the requester by providing the issuer, audience, user claims, issue date, expiry date, and the signing key which will sign (hash) the JWT payload. Lastly we serialize the JSON Web Token to a string and return it to the requester. 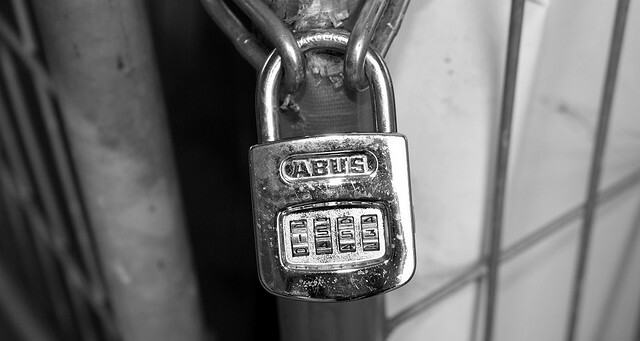 By doing this, the requester for an OAuth 2.0 access token from our API will receive a signed token which contains claims for an authenticated Resource Owner (User) and this access token is intended to certain (Audience) as well. The path for generating JWT will be as :”http://localhost:59822/oauth/token”. We’ve specified the expiry for token to be 1 day. We’ve specified the implementation on how to validate the Resource owner user credential in a custom class named “CustomOAuthProvider”. We’ve specified the implementation on how to generate the access token using JWT formats, this custom class named “CustomJwtFormat” will be responsible for generating JWT instead of default access token using DPAPI, note that both format will use Bearer scheme. Our API currently is ready to start issuing JWT access token, so test this out we can issue HTTP POST request as the image below, and we should receive a valid JWT token for the next 24 hours and accepted only by our API. The package “Microsoft.Owin.Security.Jwt” is responsible for protecting the Resource server resources using JWT, it only validate and de-serialize JWT tokens. 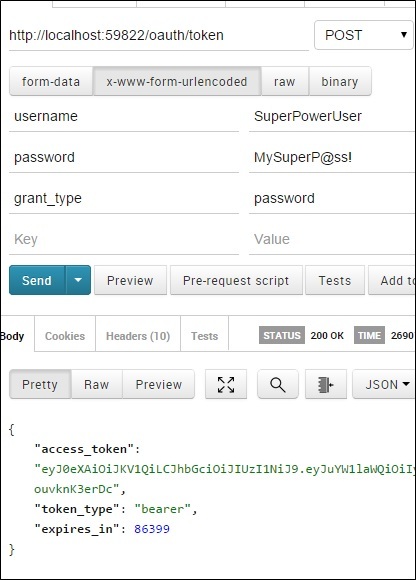 This step will configure our API to trust tokens issued by our Authorization server only, in our case the Authorization and Resource Server are the same server (http://localhost:59822), notice how we are providing the values for audience, and the audience secret we used to generate and issue the JSON Web Token in step3. By providing those values to the “JwtBearerAuthentication” middleware, our API will be able to consume only JWT tokens issued by our trusted Authorization server, any other JWT tokens from any other Authorization server will be rejected. Then we will use the JWT received to access protected end point such as “ChangePassword”, if you remember once we added this end point, we were not able to test it directly because it was anonymous and inside its implementation we were calling the method “User.Identity.GetUserId()”. This method will return nothing for anonymous user, but after we’ve added the [Authorize] attribute, any user needs to access this end point should be authenticated and has a valid JWT. 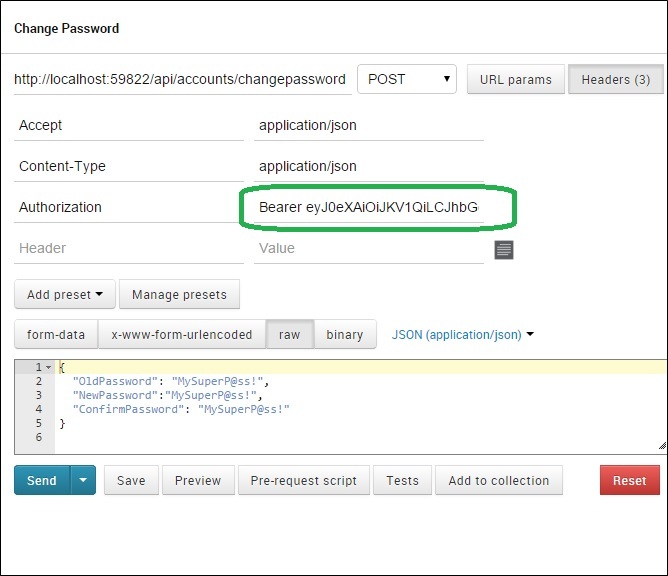 To test this out we will issue POST request to the end point “/accounts/ChangePassword”as the image below, notice he we are sitting the Authorization header using Bearer scheme setting its value to the JWT we received for the user “SuperPwoerUser”. If all is valid we will receive 200 OK status and the user password should be updated. In the next post we’ll see how we’ll implement Roles Based Authorization in our Identity service. Getting this error while posting my question. Any idea how to make it work for 4.6.1? Well, I didn’t try to upgrade to .NET 4.6.1 framework. But is there a certain package which is not compatible with the 4.6.1? I will try to take a look at it and if you find a solution please share it here. I am having the same issue “The type or namespace name ‘JwtSecurityToken’ could not be found “. Any thoughts? Thank you. Thank you so much for taking the time to share your knowledge! This article has helped me out a great deal in understanding OAuth and tokens. I am confused on how to properly generate the client_id and the client_secret. You provided a link to source code when talking about the client_id and the client_secret. Is this code used to generate these values? Thank you! You can find the code used to generate the clientid and secret in the Seed method for EntityFramework Configuration class. I am confused by this answer. Your link for the implementation above pointed to a class named AudiencesStore. Is this supposed to be added to the project? Same question here, I don’t understand how to generate the Audience id and secret. Concerning the implementation file you provided (AudienceStore.cs), shall we create a console app next to this project and use it to generate Audience id/secret ? You are right Nicky, I used a test project to generate this, sorry for not being clear describing this step. I set a break point at the end of the unit test and used the watch window to copy-paste the required data. Of cource, I added his class and a helper class “Audience” into my project. Get an “unsupported_grant_type” error when posting to “http://localhost:58604/oauth/token” as demonstrated? You are facing the same issue if you cloned the GitHub code? This I tried on ARC. This request works fine. Apparently Postman doesn’t clear the Raw field when changing the radio to `form-data`, therefore the body sent (still the Raw) is wrong and the grant_type isn’t known. Hi, thank you for your tutorial first. I have a question. There are username and password is display in the url parameters and how can we Protected user info? Make sure you’re putting the username/password/grant_type in the “Body” tab of PostMan. First, check the radio button for x-www-form-urlencoded and then enter the info in the below fields right below the radio button… It looks identical to the “Headers” section, but it’s not. “Authorization has been denied for this request.” error. I have generated the token and passed it in the authorization key in Header and also Added the bearer key. Can anyone help me? Can you make sure that you are using the same issuer without any trailing slashes? that was my problem too. Working now. Thank you for taking your time and writing these tutorials. I was getting the same error and I had not set the issuer variable properly either indeed. I had the same problem. It was my mistake – My localhost app was running on different port and i forgot change it for issuer in Startup.ConfigureOAuthTokenConsumption(IAppBuilder app) method. Getting the same error. Checked the issuer and it’s the same. I am using the same code from Git. I guess I am missing something in Step:3 to generate the AudenceID and AudenceSecret key. Using same code I am able to get users, delete users but not able to reset password. It is resolved now. I missed to call the function ‘ConfigureOAuthTokenConsumption’ from Configuration in Startup.cs file. I am getting this error: ‘cannot convert from ThinkTecture.IdentityModel.Tokens.HmacSigningCredentials to Microsoft.IdentityModel.Tokens.SigningCredentials. And for some reason, I can’t let the type convert. Sorry for the late reply, I understand your frustration but sometimes NuGet packages for certain libraries tend to introduce breaking compatibilities, the best thing to do is to check the GitHub documentation and release notes for each package and see what has been changed and try to implement in the new version. Sorry for not being helpful but I can’t reproduce your issue now. Thanks for your reply ! I had the same problem ! In AudienceId anything (I tried with an empty string), but in AudienceSecret any Sha256, Sha384 or Sha512 signature. Actually, The Sha512 one does not work. The exception is “Invalid Key Length”. I then tried a Sha256 and it worked. I then tried Sha385 out of interest and it also did not work. Same error. Obviously I might have done something wrong / different that yourself (Lug Velez Schmitz) so I leave it open to user error on my part. Just wanted to post here to help others who might get this same error. Thanks Brent for sharing this. Hi Simon, this is due to different NuGet packages with breaking compatibility, unfortunately i do not have enough time to check how to upgrade them, but if you used the same NuGet packages I’m using the tutorial then you are good and you will not face this issue. Do not use System.IdentityModel.Tokens.Jwt 5.0.0, I have 2 reasons to prevent you from update to version 5.x. Thank you very much, Taiseer Joudeh, This is a great tutorial series and it save my life. Thank you very much again. You are most welcome, happy to help. Once again loving your style of detailed explanation. Would you be pointing me to how or will you have another article about revoking an issued JWT token? Revoking an issued refresh token is all about deleting it from the DB, you need to delete the identifier for it and that’s it. Just wanted to add a warning about using “TextEncodings.Base64Url.Decode(..)”. We were having some problems with some of our values that had ‘+’ or ‘/’ characters in them. We followed Brock Allen’s advice at https://brockallen.com/2014/10/17/base64url-encoding/ where he said to use his custom decoder that would handle these characters correctly. Which is basically the same as changing the code above to “TextEncodings.Base64.Decode(..)” (NOTE: without the “Url” after the “Base64”). Both absolutely incredible and impossible. Incredible that it works and impossible to do it yourself from scratch. After following your first tutorial series, I now jump from series to series picking what I need, and it really works out very well. Hi Torsten, thanks for your comment and I’m glad to know that all the posts are helping you building your solution. I keep getting a 404 error and can’t figure out why that is the case. Why would I not be able to do the post call anymore? It’s like that route does not exist anymore and I can’t figure out why. The bearer tokens are self-contained tokens, you can’t update them at run time. I recommend you to check “Reference Tokens” where you can achieve this, but the drawback that you will hit some store to get updated policies from. I am generating JWT just fine. The problem is when I test it on jwt.io it fails because something is apparently setting the alg property to “http://www.w3.org/2001/04/xmldsig-more#hmac-sha384”. jwt.io is expecting HMACSHA256. Hi Jeff, that is strange, are you using the same code base shared or you have changed the signing approach? I figured it out. My original secret was created by Auth0. The secret was more than 32 bytes, that caused the ThinkTecture HmacSigningCredentials method to create the token using HMACSHA384. HmacSigningCredentials has a switch statement that sets the `alg` property based on the length of the secret. After creating a 32 byte secret which equated to HMACSHA256, which is compatible with jwt.io everything worked fine. I followed your tutorial with my sample application. I am getting the token but when I try to access one of the protected API’s I get “Authorization has been denied for this request.” error. I am using the same issuer without any trailing slashes. Can you please help me?? Seems like using AudienceId as empty string does not work. To resolve this issue I had to put AudienceId as “Any”. Can you try to debug the token using http://jwt.io and check the issuer matching what you have used, as well check the signature in jwt.io. Yes I can find the same issuer and signature is also verified. I guess issue was AudienceId was not assigned. powerful Article . Thank you….!!! “The inline constraint resolver of type ‘DefaultInlineConstraintResolver’ was unable to resolve the following inline constraint: ‘uid”. My bad I did a very simple typo error in the attribute routing. I fixed it now. Thank You! Great tutorial I have learnt alot from this. Look forward to follow new tutorials from you. now that I have this working, by using the same token mechanism, what would it take to expose the rest of the api (no credentials included) to the outside? never mind, starting part 4 made me realize the answer is there. However this results in all requests being rejected. Why? Thanks for the articles, they have been very informative. You are welcome, but could you elaborate more? I didn;t get what you are trying to achieve. Hi, I cant seem to work out how to get the Authorize attribute to validate the Token expiry and not before date time. I must be missing something simple. I have a error “XMLHttpRequest cannot load http://localhost:51860/oauth/token. Response to preflight request doesn’t pass access control check: No ‘Access-Control-Allow-Origin’ header is present on the requested resource. Origin ‘http://localhost:3000’ is therefore not allowed access. The response had HTTP status code 400.” when I try send request from domain localhost:3000 to URL localhost:51860/oauth/token? This is CORS issue, make sure that the server you send request to contains the client “JS” URL in the “Access-Control-Allow-Origin” of the server. Can I add a determinate list of URL into “Access-Control-Allow-Origin” instead of “*” ? Thank you very much Taiseer Joudeh. Thanks for your message, but what is the grant type you are using? I think the same, maybe the next part could be in Angular 4. Hi Marzouk, dropped you a comment on SO. Getting the same error any help? Please how to generate the Audience Id and Audience Secret ??? Taiseer Joudeh i didnt really understand hwo to generate the Audience ID and Audience Secret with this project , can you provide us how to do so ? I am following your post and found it really useful. Currently I got stuck to generate “as:AudienceId” and “as:AudienceSecret” keys. Can you please provide block of code of this implementation. Its difficult to understand the ‘implementation’ https://github.com/tjoudeh/JWTAspNetWebApi/blob/master/AuthorizationServer.Api/AudiencesStore.cs . Nice explanation. I am having doubt related to my project architecture. I want to create 3 Layer architecture with presentation layer(AngularJs), business logic layer (Web API) and data access layer(DAL) which would use the same DB for the authentication as for the other data. Is there any way to separate my data access layer from business logic layer with OWIN (JWT) authentication ? Thanks for your time and your knowledge you are sharing with us , may GOD blessed You for that. In case we want to validate the request if our client is not trusted, can you provide the code for it or a link that deals with it. I run demo not successfully, sql database script not found from your solution. Please give me a database script. I have just found in issue config, we used Entity Data Migration. Even if i am not putting [Authorize] on my Controller it will throw “Authorization has been denied for this request.” Can you help me in this.? I don’t want to authenticate whole controller. Just want to authenticate some actions only. How i can do that? When user is incorrect, a Bad Request is received instead of the invalid grant. any help on this, please?